Everywhere you look, there’s another article about how kids are getting “rounder”. As they say, the acorn doesn’t fall far from the tree. You don’t have to look far to see that obesity is not only a problem for children–it’s also a big problem for their parents. But there are also overweight children who have normal weight parents who eat a healthy diet. What’s going on here? Yes, size does matter when it comes to feeding baby. Sometimes just the bottle size makes a difference to how much a baby drinks. In this study in Pediatrics, babies that were 2 months old and fed with a bottle that held more than 6 oz. were more likely to be more overweight than babies who drank out of a bottle that was less than 6 oz. Is that a case of “portion distortion” starting way early! Maybe. Because of the age old concept of “a chubby baby is a healthy baby” lives on among parents, grandparents and some medical professionals, the opportunity for early intervention is often passed up. Research shows that there is a direct connection between patterns of excessive weight gain by 4 months and a child being considered obese at 5 years. We know that not getting enough shut-eye can play a role in chronic disease in adults, affecting weight and blood pressure. (Here’s a good read from WebMD.) But can you believe that the amount of sleep your baby and child get also affects their weight? Yes–it’s true and you can read more about it here. 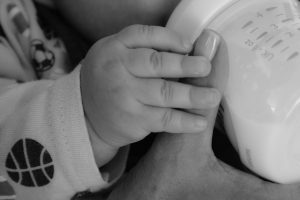 Should we be putting babies on a diet? No! But we should be looking a little closer at how we feed babies, putting more emphasis on breastfeeding and how sleep and other factors could program a child’s future health. For more tips on preventing childhood obesity, starting early, check out my book Baby Bites! Find my posts on breastfeeding here: What’s a Healthy Breastfeeding Diet? « Channel Your Cravings into Something Healthy! I always love your posts, Bridget. Love how deeply you care for kiddos and mommas and providing the best nutrition guidance and support to families! Enjoyed reading this article!